Professor Wu is a Professor of Surveying and IT at the School of Art, Design and Architecture, University of Huddersfield. He is an expert in computer modelling and simulation in the built and human environment. His current research interest is in the area of Reality Computing which covers 3D scanning, UAV data capture, Augmented Reality, Virtual Reality and game technology. He was the Lead Researcher on a number of EPSRC funded projects including ‘3D to nD modelling’, ‘nD game–using gaming technology to engage school children’, ‘Process Protocol’, ‘Salford: China Research Tour’, etc. In 2010, Song was awarded UK China Fellowship for Excellence for his collaboration research with leading Chinese research institutions. In 2012, He was awarded RICS Education Trust funds to investigate how Building Information Modelling supports surveying practice in the UK. In 2015, his work on human behaviour simulation for energy simulation was supported by the Royal Academy of Engineering. His research works have been widely published in over 100 research publications around the world. 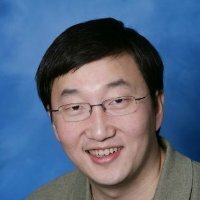 Professor Wu is leading the game design work of the research centre. For more information on Professor Wu, please visit his profile.